The best collapsible weapons balance portability with functionality. Having a weapon that is effective and collapsible can make your chances of survival higher when SHTF. 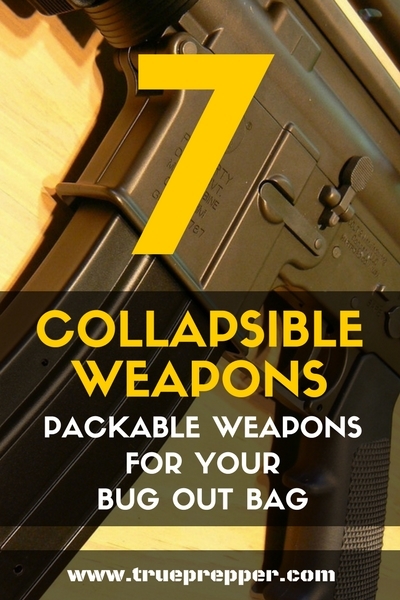 Anything that is collapsible is usually a homerun for a survival oriented bug out bag. Collapsible containers, tents, bags- they all make better use of the limited space a bug out bag offers. While you may sacrifice some immediate usefulness by having to reassemble or expand these items, the space savings is usually worth it. Collapsible weapons are no different. Being able to store a packable weapon in a relatively small space is a big advantage. Below, we will take a look at firearms, hunting weapons, close quarters weapons, and even an opportunity weapon- all of which are collapsible. A LEO favorite, the baton is quick to deploy even though it is collapsible down to a very small size. A telescopic baton can give you even more leverage in a close quarter encounter. The baton is very inconspicuous when not extended. Deploying the baton with a flick of your wrist is a quick way to show you mean business and gives you much better reach. As with any weapon or fighting technique, you can’t just go throwing one into your bug out bag and then call it a day. You will need basic training at the very least. A baton is well worth the time you spend training with one, due to its portability, packability, and the element of surprise. The odds that you will need a recurve bow immediately for hunting is fairly small, so having to put it together and string it is not a big deal. The huge amount of space savings more than makes up for the hassle. Takedown bows also have the benefit of being able to swap out limbs if they are damaged, or if you need to change resistance. The Samick Sage Takedown Recurve is 62″ long, but is 25″ when disassembled. Each limb pops on and off easily with a single, sturdy threaded knob. It is also very light at less than four pounds. Simply unfold, and you are ready to sling away. While most do not envision a slingshot as the ideal weapon, you cannot deny it’s simple to use functionality and portability. Besides using it for defense and hunting small game, you can use it to shoot string or line over tall limbs. This helps you stow packs and food out of reach of predators, string up tarps, or even climb a tree with a safety line. It is a silent weapon for the most part too. The Trumark Folding Slingshot comes with the folding wrist brace, which helps with accuracy. It also comes with a price tag under $10, which is always nice. It has no frills, which may not make it the slingshot of choice for experts, but it makes it perfect for survival. All of these strengths make it worth the tiny amount of space it takes up in a bag. 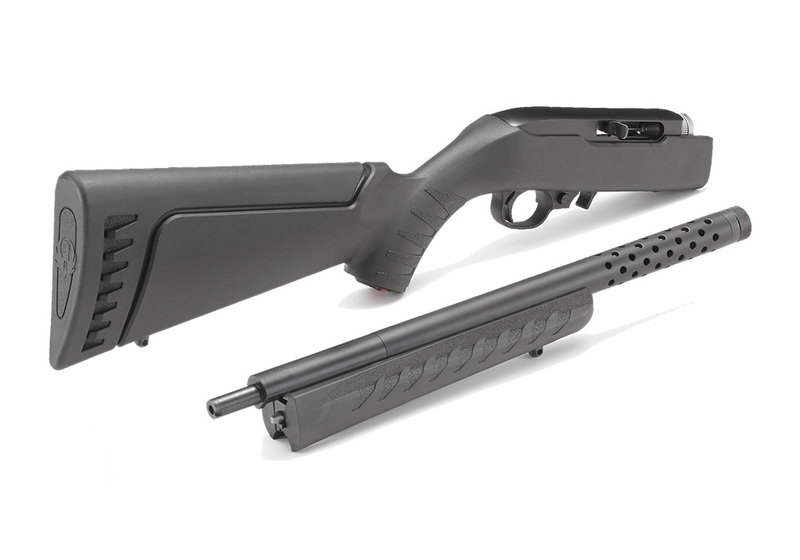 A solid .22 takedown rifle has become a survival kit and bug out bag staple. The collapsible nature of the rifle makes it a great choice for a semi automatic weapon for when SHTF. While the length can vary by model, most disassemble to less than 23″ long. This makes them extremely easy to store. When taken apart and stowed away, the small outline lets you move much less noticeably and does not bring attention to you like a traditional long rifle would. Most camp shovels are collapsible. Most camp shovels make a great impromptu defense weapon as well. This Gerber E-tool Folding Shovel makes an intimidating defense weapon and doubles as an even more useful tool, all by adding a sharp serrated edge to the camp shovel. The one drawback is the very thing that makes it so versatile- the sharpened edge. If you are not used to using one, you could possibly hurt yourself when chopping. Survival situations can make us have more accidents, just from stress and fatigue. While not typically referred to as a collapsible weapon, the AR comes apart by pushing two pins and detaching the upper receiver. Stowing it in two separate pieces may not make you as ready for any situation you could encounter, but it takes up much less space. The reduced length is really where detaching the upper receiver comes in handy. 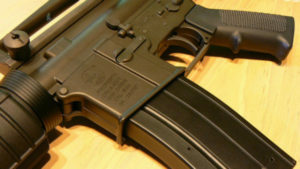 Most rifles have to stick out beyond the edges of a pack, and make you easily identified as someone carrying a firearm. This is not the case with the AR when disassembled. 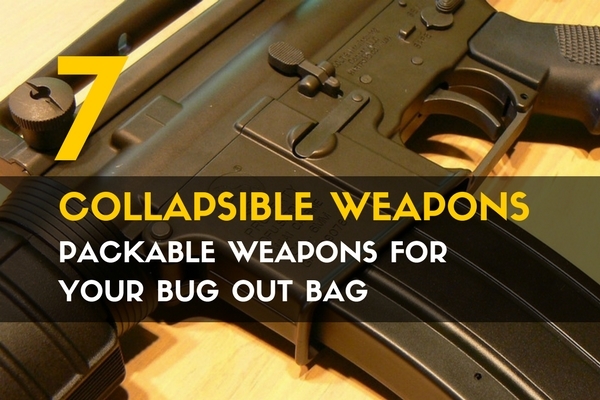 You can easily bug out quietly and unnoticed with an AR disassembled in your pack. 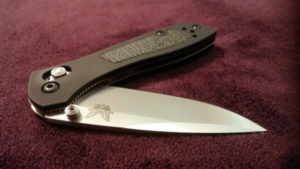 We know: folders are not as good as full tang knives for survival situations. But they do take up less space and are easily packable. We prefer using folding knives as part of our EDC for utility purposes rather than self defense, but that doesn’t mean they aren’t worth considering for a bug out bag. While you don’t want it to be your only blade in a survival scenario, they make great utility knives or backups. If your folding knife is swiss army or part of a multitool, you trade much more versatility for a little less functionality. I, for one, keep a multitool in all of my kits and would definitely use the folding knife portion as a weapon, if needed. The trade off between convenience and portability is always a challenge when developing a bug out bag. The weapons cover the range of non lethal to lethal and quick deployment to long setup times. All of them are worth considering adding to your pack, if you can find the time to train on them properly. The multi-functional collapsible tools really shine since redundancy in survival situations is never a bad thing. The old adage that “two is one and one is none” is great to remember when you are selecting items for when SHTF. Keep exploring, stay prepared, and be safe. You didn’t mention the Henry AR7, a .22 rifle that comes apart and stores in the stock and will float if dropped in water, originally made by Armalite and reintroduced by Henry, Armalite made a .22 and a .25 version and as far as I know Henry only makes the .22 version, there are other compact folding .22 rifles available but most are single shot while the AR7 is a semi auto and I believe holds 7 rounds in its removable magazine, there are others that have a rifle and shotgun combo again only in single shot, while a .22 may not be best suited for defense it has put food on the table for many years and for a survival situation it would be a welcome addition. Good catch, Jerry. We were holding off on talking about the AR7 because it is truly designed around survival and deserves its own discussion. It disassembles into such a small package, is really versatile as you pointed out, and had been in service for so long- there is plenty to talk about on its own. There is also the Sub-2000. Ready to fire in a few seconds and its a 9mm. +1 for the sub2000, it is a PCC that can use the same magazines as your daily carry. It can also be fitted with a red dot to extend range.